The advent of autonomous driving systems will not only change the nation's roadways, but also alter the legal landscape for consumers, automakers, lawyers, insurance companies and others, according to a new study from J.D. Power and Associates and law firm Miller Canfield. "Consumers are far more likely to settle product liability claims out of court, as long as they feel that there is transparency and fairness in the process," Zlatina Georgieva, a Miller Canfield attorney and co-author of the report, said in the statement. Kristin Kolodge, executive director of human-machine interface at J.D. Power, said consumers remain cautious about robot cars -- and there's still a need to build trust. 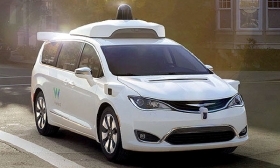 "Sentiment remains fragile towards automated vehicles as consumers are cautious and the need to build trust continues," Kolodge said in the statement. "Consumers express an expectation that collisions would not occur with automated vehicles and are holding [autonomous driving systems] to a higher safety standard than traditional vehicles." According to the survey, 46 percent of the 1,500 respondents said they "definitely" or "probably" would not ride in a fully self-driving car -- a vehicle without a driver, steering wheel or gas pedal. The survey was released the same week a self-driving Uber struck a pedestrian in Arizona, resulting in the first known death involving a fully autonomous vehicle. Despite projections that autonomous vehicles could reduce traffic accidents by 90 percent, respondents who were skittish about self-driving technology largely weren't swayed by assurances that the vehicles would meet federal safety standards -- 78 percent of those respondents said they still wouldn't ride in an autonomous vehicle. While the study showed strong interest in out-of-court settlements, it also signaled a willingness to litigate claims related to autonomous driving systems. More than half the respondents (51 percent) said they would sue an automaker of a fully autonomous vehicle if it was involved in a crash that caused injury. Potentially troubling for carmakers is that the percentage of younger people, those most likely to use autonomous vehicles in the future, who said they'd seek litigation was higher than that of older generations -- 62 percent of Generation Z, those born between 1995 and 2014, said they would pursue litigation, compared with 53 percent of baby boomers. In a positive sign for the industry, 74 percent of respondents indicated they would share data from the vehicles after an accident, providing automakers and suppliers opportunities to prevent similar malfunctions in the future, the study concluded.